There we were; lazily coasting down the Russian River in quiet isolation, water calming lapping up along the sides of the boat, birds chirping in the distance, sun shining, and river glistening… Or, at least, that is how I imagined our day on the calmest stretch of the Russian River. 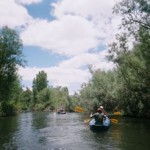 Reality was more of a silly family adventure of spinning, bumping, ducking, splashing, and paddling our way from Healdsburg to the Wohler Bridge in the Dry Creek Valley; never very wet or wild but with plenty of laughter and surprises. 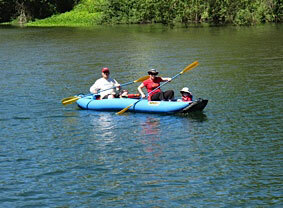 A whole hodgepodge of people turned out at Russian River Adventures that Sunday morning. Some looked like they’d done this before; others like they had just come off of an all-nighter. There were families, bikers, athletes, some less than athletes, dogs of all sizes, and a pregnant woman; like I said, it was a hodgepodge. 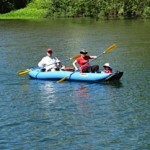 After everyone was checked in, we walked en masse down the street, across a bridge, and to the far side of the Healdsburg Veterans Memorial Beach Park where we found a fleet of long blue inflatable kayaks, like a cross between a traditional kayak and a raft. We were provided a thorough briefing on what-to-do, what-not-to-do, where-to-go, what-to-avoid, and who-to-call if you got to some landmark first so they knew it was time to come pick us up. Everyone watched intently but you could see the information struggling to penetrate the glazed faces. My vision of us coasting down the river in quiet isolation gave way to images of a flotilla of inexperienced kayakers bumping into each other as they scrambled to maintain control of their vessels. Kayaks were assigned and groups launched one-by-one; the spinning started, some got stuck on the sandbar only ten feet away, others entered the first riffles backwards. We waited until the end so my family could join us in their kayaks; two red Hobies and an inflatable kayak carrying my dad, brother, sister-in-law, and three nephews. Our launch went smoothly, confidence was up; we were sure we could handle the kayak but then there we were, spinning through the riffles, ducking to avoid branches, leaning into the protruding mass of bushes to avoid tipping over. Then we straightened out, smiled for the camera, and looked ahead to a giant pillar in the middle of the river supporting highway 101. They told us something about this. What was it? Which way do we go? My husband and I began discussing and he yelled, “Go left!” So, we went left, ducking again to avoid more branches. Ok, only three more hours to go! The shallow water was something of a comfort, when we weren’t stuck. I had images of swimming after a hysterical child while our boat drifted off without us. It never happened, but they warned us that the boats will tip! It almost always happens to someone. Most of the time the water was shallow enough that a person could stand up, so tipping probably wouldn’t have been too bad; just didn’t want to give it a try. Getting off the shoals usually just involved a coordinated scooting motion but sometimes we (mostly my husband) had to get out and push. As the day went on we got better at seeing the shoals before we found ourselves sitting on them. Keeping our family of boats together was sometimes a challenge. The Hobies had pedals that helped in slow parts but one of them was towing the little inflatable with the kids. That created some funny situations when the inflatable decided it wanted to go down the opposite side of the sandbar from the lead boat. So, we leap frogged our way down the river. The nephews had brought water guns. We were not packing so my husband set his sights on hijacking one of the guns at the back of their boat. We paddled hard to catch up and mission accomplished! A water gun fight ensued. The modern day water guns have way more fire power than the puny squirt guns of my childhood. Everyone got wet! Along the river we spotted boats pulled off to the side and people kicking back in sun. It was perfect weather. The morning gray had burned off to a nice warm sunny sky. We took our turn on sandbars, stopping to eat, skip rocks, and rest our tired arms. Gradually the sandbars disappeared and the last hour of the ride was through a wide deep stretch of river; with almost no current. The Hobies hooked up their pedals and were soon out of sight. 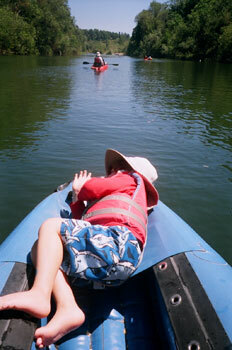 We tried to coordinate our paddling but somehow just went in circles. 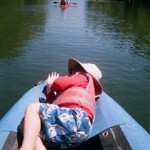 Our son curled up on the soft bow of the boat and fell asleep to the rhythmic sound of the water. 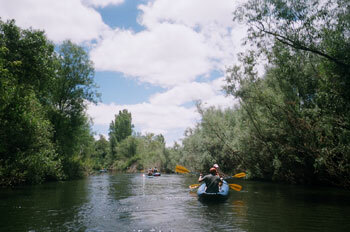 So, there we were; lazily coasting down the Russian River in quiet isolation, water calming lapping up along the sides of the boat, birds chirping in the distance, sun shining, and river glistening… Well, maybe not so lazily for my husband; he was doing the paddling.